I used to be relatively infrequent, so I had endured until now, but I was able to afford so I bought only the ones that were frequent. I am still using it and I can feel relieved. It can be fixed nicely to the ratchet you already have. This review is about item#2178136. Additional purchases were made to enhance the tool types. I think that cost performance is outstanding because it is cheap for strength and accuracy. This review is about item#02178145. I am satisfied because there is no play and there is a sense of security. Finishing is also good. This review is about item#02178154. Unlike other companies, hexagonal parts are plated so it is good to have a high-class feeling. Since the knurling process is applied to the part of the torso, it does not slip at the time of desorption, it can also be quickly rotated by itself and it is very easy to use. This review is about item#02178111. I use it when 2 ton truck oil is changed. Although it was KTC so far, I recently purchased items of Tonne well, I think that I can trust here as well. This review is about item#39502461. I used a cheap HEX socket to remove the rusted hollow set screw of the sprocket, so I bought it suddenly because the thread from the hexagonal root was torn off. I could unscrew the screw without breaking even if it was used in the same way. This review is about item#2178102. Although there is no problem with strength, I want you to make a long one a little more. This review is about item#02178127. Tone is a good product The finish is very polite. You can also trust the feeling of use. This review is about item#2178127. Tone is a good product The finish is very polite. This review is about item#39502531. 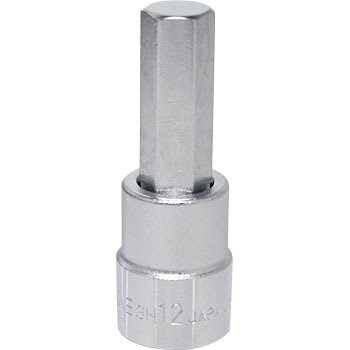 It is used when tightening the inner hexagon bolt. I think that wear is little. This review is about item#02178136. TONE thinks that the quality is good. As 7 mm is hard to find, it is saved. Very easy to use and enough strength. I am using koken, but the tone is also nice. Remove brake calipers of foreign cars, exchange pads. This size is not in the home center but if you go to the tool specialty shop it will be available but it is troublesome so I ordered it. It is saved to buy even this small tool. There is no problem with normal use. Choose this product considering quality to some extent, quality, use impression is also well convinced.